I make no bones of the fact that I like to travel. In my younger years I didn’t always get the chance to do much travelling, but in my thirties I am doing more and more; I love seeing new places, soaking up history, trying new foods and exploring new places. Last year was an amazing year for travel, expecially our wonderful honeymoon to the US, and I’m hoping to travel even more in the next twelve months. I originally sat down to write about the ten places I’d like to visit this year….but that just didn’t give me much scope. 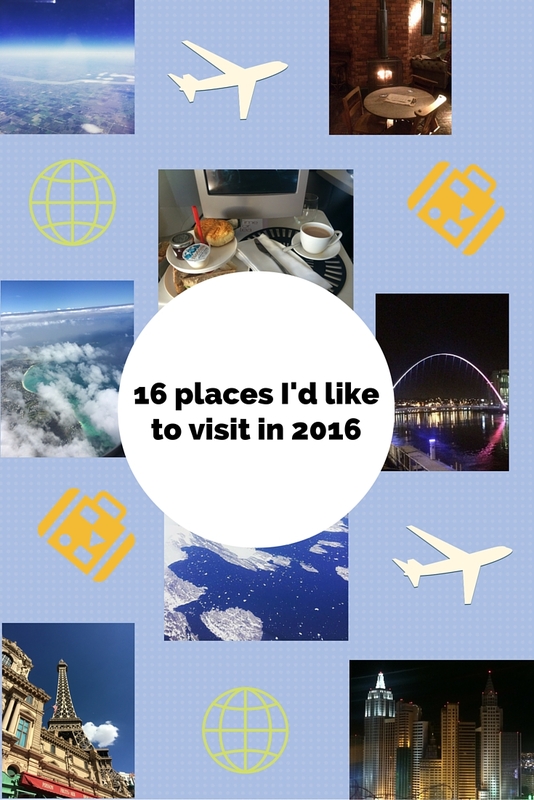 So here are the sixteen places I’d like to travel to in 2016. Some of these are already booked in (Matthew and I are definitely planners by nature! ), some I’m researching right now, and some are still at the pipe dream stage. I don’t think I’ll manage all of them, just from a funds and time position, but oh, imagine if I could…. I’ve wanted to go to NYC for ages, but have never actually made it across to the Big Apple before. We’ve booked several days her when we head across the pond for our big holiday of the year and I’m so excited. I can’t wait to see the city I’ve seen on screen a thousand times, to soak up the culture, and to try the food, which I’ve been assured is out-of-this world. I was talking to some fellow Scots-in-London the other day and talk turned to the homeland in general and the islands in particular. It has been over a decade since I’ve headed to the isles, so I had to pop Skye on the list. Probably in the spring or summer. The Danish capital has long been on my wishlist, and at the current time seems a good chance for a visit. For the first time in, well, ever, I’m not behoven to the school calendar – so I’m determined to make use of my flexible schedule to see more of Europe on short breaks. I lived in Luxembourg for a few months after university, working as an au pair. While the job was trying (long story), I loved the country. We’re hopping over for a long weekend in the spring and I’m excited to explore more with Matthew in tow. He’s pretty excited at the thought of catching some Luxembourgish footballing action – another nation’s football to be enjoyed! I spent four years in Aberdeen while I was studying…and have been back about four times since! The Granite City is a beauty, so I’m looking forward to a little jaunt north at some point. I’m excited to take a little trip down memory lane! I’ve visited Toronto before and adored it, so I am psyched to return – it’s one of my favourite cities on the planet! We’ve built a few days there into our North America holiday and I’m so excited to eat, drink, shop and explore this great place some more. I have never been to Portugal, which seems crazy given the sheer volume of flights available. I might change this a little and go to Faro or Porto rather than Lisbon proper (although that’s the frontrunner), but Portugal is firmly on the list. I’ve read so many books where people go to a cosy cottage in the Cotswolds. This year, I would like to go to a cosy cottage in the Cotswolds. We had such fun in Vegas last year, and I was so pleased with how fun it was, as well as glamourous! I’m looking forward to more casinos, more shows, more adventures when we visit in the autumn. I’ve spent a little time in Wales, but my time has all been spent in either the Brecons or Snowdonia. This year I’d like to take a short break to Cardiff, to explore the Welsh capital a little – I’ve heard great things! Hailing from Moray, this region of Scotland has frequently been a place I’ve been through, not to. Pitlochry I’ve visited a fair few times and would like to see again, Perth I’ve only ever seen from the A9 or the train station. I’m looking forward to finding out what delights it may have to offer! For at least the last five years, we’ve discussed going to Italy. This year I’d like to actually start going! Another leg of our ‘big’ holiday, I’m so excited to see what this city is like, and doing lots of fun history based sightseeing. Chalk this up with Portugal on the how-have-I-not-been-there-yet-it’s-so-close list! I think Iceland is just the most amazing place, with geography and culture by the boatload. They are also mad keen on reading, so I imagine I’ll fit in! I lived in Germany for years as a child…but never made it to Berlin. This year, I’d like to fix that. As you can see, I clearly have some planning ahead! Which places are on your ‘to visit’ list this year? I'm very excited – I love Madrid and have heard such wonderful things about Barcelona. I adore architecture so will be very happy there I thinK! Thank you – I adore the Islands but haven't been in far, far too long! These are going to be an AWESOME arsenal of adventure! That is a great list! I would love to meet up with you for a quick Tim's if you have time while you are in Toronto!